What conditions does Proair HFA Aerosol With Adapter treat? List Proair HFA Aerosol With Adapter side effects by likelihood and severity. Before using this medication, tell your doctor or pharmacist your medical history, especially of: heart problems (such as irregular heartbeat, angina, heart attack), high blood pressure, seizure. If you are using this medication on a prescribed schedule and miss a dose, use it as soon as you remember. If it is near the time of the next dose, skip the missed dose and resume your usual dosing schedule. Do not double the dose to catch up. 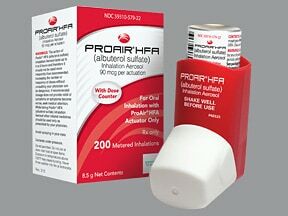 Are you taking Proair HFA Aerosol With Adapter? Are you considering switching to Proair HFA Aerosol With Adapter? How long have you been taking Proair HFA Aerosol With Adapter?